‘Works with Nest:’ The Best Choice for DIY Smart Home? Are you confused by all the different connected home standards out there? No one would blame you if you were. The sheer number of available options takes even those of us who claim to be experts aback. There’s the months overdue Apple HomeKit (which apparently now requires you own an Apple TV box), Quirky’s Wink, D-Link’s Z-wave hub, Staples Connect, Insteon and plenty more you’ve likely never even heard of before. And they’re all competing to be the one standard adopted by millions – to be the lone VHS in an industry filled with Betamaxes. It’s hard calling one of these “the best” until the industry shakes out a little bit more, but one of the most impressive of these standards is Google’s Works with Nest. Last year, my parents installed a Nest smart thermostat in their home. It’s more than just a thermostat now, though – it’s a smart home hub. 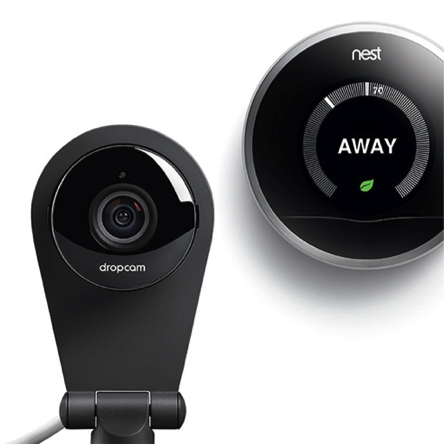 If my parents’ Nest is in “Away” mode, their new Dropcam will send them alerts when motion is detected at home. Of course, that’s just the tip of the iceberg. Works with Nest interfaces with Philips Hue lighting, Whirlpool connected appliances, the Automatic connected car adapter, the Kwikset Kevo lock, Rachio sprinkers, Jawbone activity monitors and more. These all work together automatically (if you give them permission to), turning your furnace on when you’re driving home from work, keeping your clothes wrinkle-free if you’re not around the dryer and turning on your home sprinkler system if Nest Protect detects a fire. What makes Works with Nest stand out from the pack, however, is its beautiful user interface. The Nest app is well-designed and a pleasure to use, unlike the frustratingly poor D-Link app associated with our first-generation home security cam. It’s also reliable – I’ve never had connection issues in the way I have with my Belkin WeMo products. And best of all, it all centers around a useful product – the money-saving Nest smart thermostat – as opposed to a clunky “hub” that does little more than take up space. If you want to learn more about Works with Nest, visit the company’s website. You might also want to check out these 4 simple ways to make your home a connected home.